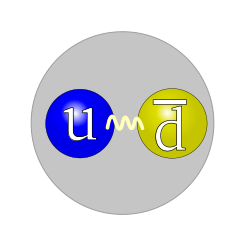 Since the discovery of the Higgs boson at CERN and the three-standard-deviation excess seen by the CDF and DZero experiments here at Fermilab, the experimental community has been focusing on measuring the properties of this new particle. It’s important to determine whether there is just one new particle or if two or more are contributing to the observed data. The answer at the Tevatron could be different from that at the LHC, as the mixture of production mechanisms and the decays contributing to the most sensitive searches are different. 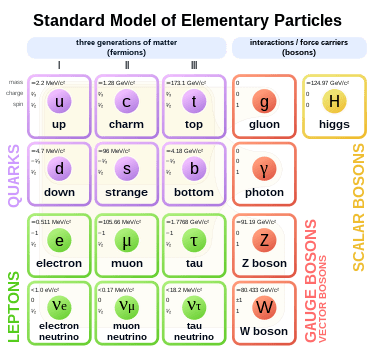 The Standard Model’s predictions are that the Higgs boson has all the properties of a heavy piece of the vacuum — there’s no electric charge, or any other kind of charge for that matter. It should have no intrinsic spin, and it should look the same when reflected in a mirror. In short, the only non-zero properties it is expected to have are its mass and its interaction rates with other particles. The quark structure of the pion. it could be a pseudoscalar — that is, its wave function could change sign (from positive to negative or vice versa) when viewed in a mirror. A group of theorists recently suggested that collisions at the Tevatron producing such Higgs impostors in association with the vector bosons W or Z would have very different measurable properties from those predicted for Standard Model Higgs events. The exotic Higgs bosons would have more kinetic energy on average than their Standard Model twins, and the recoiling vector bosons would also be going faster. Best-fit signal strengths μ for two cases. Left: the Standard Model versus graviton-like boson (spin 2, positive parity) versus the Standard Model Higgs boson (spin 0, positive parity). Right: the pseudoscalar boson (spin 0, negative parity) versus the Standard Model Higgs boson. CDF has adapted its sophisticated searches for the Standard Model Higgs boson in the WH→lνbb, the ZH→llbb, and the VH→METbb modes to search for exotic Higgs bosons — the pseudoscalar boson, labeled 0- in the above figure, and a graviton-like spin-2 boson, labeled 2+. The exotic particles were assumed to be produced either in place of the Standard Model Higgs boson or in addition to it. The figure shows the best-fit signal strength parameters μ, which are scaled to the Standard Model Higgs boson signal strength, for both the 0- and 2+ searches. In neither combined search is there any hint of the presence of an exotic Higgs boson, and we observe consistency with the presence of the Standard Model Higgs boson.